Next, I headed north to the Gagosian gallery. On my way I was distracted, captured by Hope Gangloff’s large-scale illustrative painting in the window of the Inglett Gallery. The works are like casual snapshots with extreme attention to detail presented in a hip, fresh, new light. 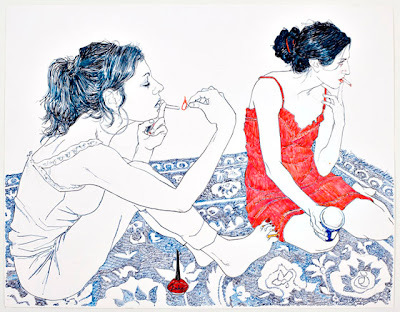 I am particularly fascinated with Gangloff’s line work, each hair is drawn separately.